So before I share these oh-so-simple-you're-going-to-scream-napkin-sleeves I wanted to take a moment to thank everyone who stopped by and dropped a note on Friday's post. Holy mermaid! There is life out there after all! I really appreciated all your insight into the whole blog commenting situation. It turns out there are a whole host of reasons why readers don't comment on blogs as much as they use to and it has nothing to do with me smelling. Phew. In all seriousness, you guys made my day and it's great to know you're out there lurking about! So as I mentioned before don't hesitate on stopping by to say "hi" every now and then. Alright, enough about that-let's chat about my holiday napkin situation shall we? 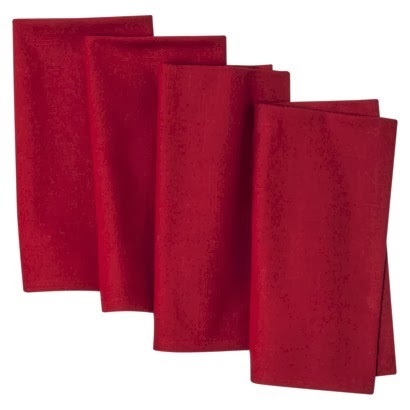 In the past I've always dressed our Christmas table with paper napkins. GASP! I know, I know. Well, not this year folks. Yep, that's right this holiday season our guest will be treated like ROYALS (how many of you now have the Lorde song in your head now?) thanks to thee almighty Tar-jay. That's right,we're moving up in the world and going linen. I picked up these red Threshold napkins at Target last week along with some table cloths for cheap, cheap, cheap. They were 10% off + Cartwheel was offering an additional 15% off (if you are not using that app you are seriously missing out!) + I had a $5 off Threshold coupon as well. 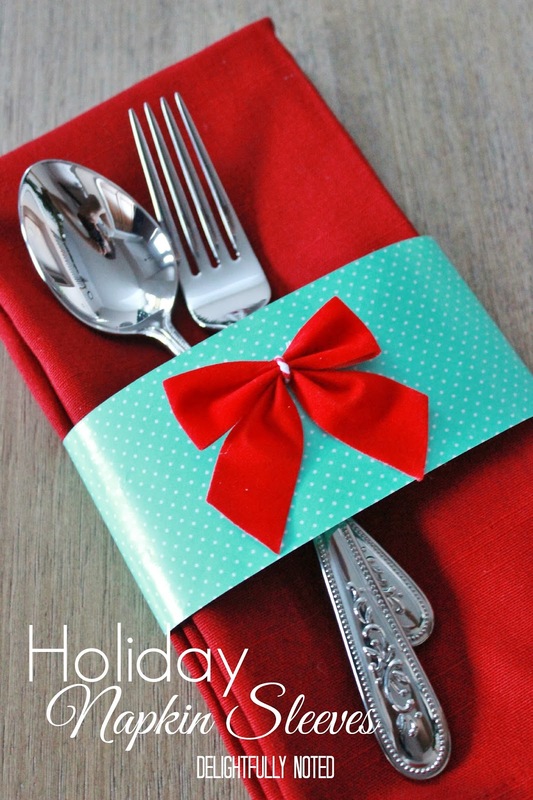 I wanted to dress my napkins up a bit so I dove into my craft closet to see what I could come up with. After getting lost in there for what seem like hours I walked out with some mini velvet bows from the Dollar Store and a roll of polka dot paper (I believe from Martha Stewart-it's texture is similar to wrapping paper). The paper was the perfect width to wrap the napkins so I decided to use it as the sleeve base. I just simply cut enough to wrap around the napkins and attached the ends of the paper together in the back with double sided tape. The bows were cute but they were held together with gold twisty ties and my dinner china is white and silver and that just seem to bother me that they wouldn't match! Bakers twine to the rescue! I removed the twisty ties and wrapped a strand of red and white bakers twine around each of the bows. Then I adhered the bows to the top of my sleeves with some hot glue and look at that........instant napkin decor! See, I wasn't kidding when I said these were simple. How many of you are hosting for the holidays? Are you a paper or linen household-or neither, you use your pants? Shh...I won't judge. Speaking of holiday dinners can you imagine how AWKWARD Kim-Jong-un's Christmas dinner is going to be this year? super cute! ...and I actually like the candy-cane stripes of the twine better than the original gold (gasp!)! So cute. Love how you used the baker's twine to replace the gold. Perfect! The colors are so perfect together!!!! I hope you and your family have a wonderful kitchen.